Native to the southern United States, the loggerhead musk turtle is akin to the kinosternidae family. They are prevalent in southeastern Tensaw River to the east of Apalachicola River. 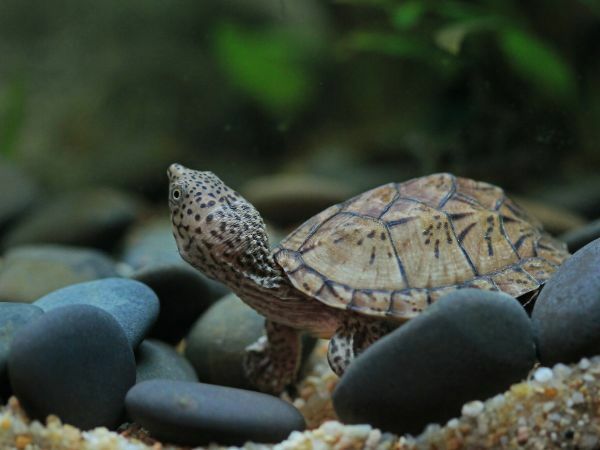 Like most musk turtles, loggerhead musk turtles are also small in size, but unlike other musk turtles, these have a larger head. Their carapace is about 3 to 4 inches in length. It gets its name because of its large head, in comparison to its body. On its carapace, it has a central keel that is quite prominent. The other keels present may fade as the turtles get older. The round head is usually brown or light grey in color and may have either spots or lines. They normally have a lifespan of 20 years. They have a small plastron that is either pink or yellow and does not contribute too much to their protection. 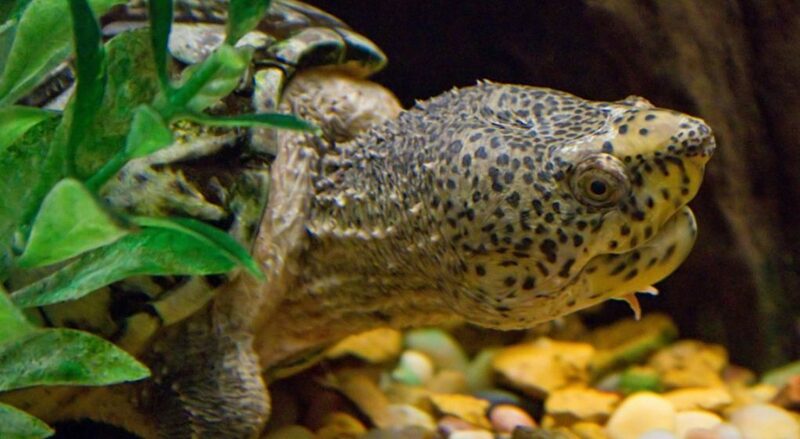 Loggerhead musk turtles are carnivores by nature and often eat insects or plants. They have strong jaws and may use them to eat other turtles or to crack the shells of their prey. Their feeding habits are very similar to striped mud turtles; both race squares are considered mostly carnivorous. However, they’ll eat some plant material. Their diet includes aquatic insects, crayfish, mollusks, and the most popular tiny snails. They occasionally eat algae from rocks or carrion. They may even consume decayed matter they find on creeks and river banks. While eating in water, they can consume tadpoles, fish eggs, and duckweed. The loggerhead is an aquatic turtle that lives in freshwater ponds, streams, and lakes. They like staying in water and only bask rarely. They like to climb cypress knees & logs to sit on in order to bask. They can be seen out in the day but are considered active both during the day and at night. Loggerhead musks stay underwater for a long span of time, actually getting their oxygen from the water. In winter, they hibernate underneath soft bodies of mud or in between rocks. They can often be seen strolling in river bottoms and along creeks. Males reach their sexual maturity earlier than females. The average maturity year in males is 4 years while females mature in 8 years. The egg-laying season is commonly in spring and lasts till summer. Mating takes place underwater, but the females leave the water to lay eggs. The eggs are elliptical in shape. They lay two to five clutches that contain one to five eggs each. They lay these eggs under logs or wet organic debris along a creek or stream. Eggs may also be laid in the nearest sandy area where they dig nests. Depending on the temperature, the eggs normally take 61 to 119 days to hatch. The incubation lasts for 60 to 120 days. 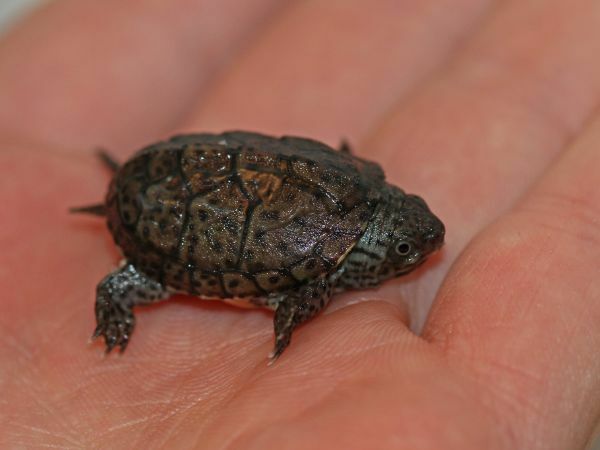 Hatchings have a small carapace and pinkish plastron and are only about an inch or so when born. Nests fall prey to birds, reptile, and mammals like skunks, raccoons, crows, opossums, and common king snakes whereas the adults are predated by alligators, snapping turtles, alligator snapping turtles, huge fish, and cottonmouths usually. The juveniles have predators that generally include larger vertebrates. Primary predators of adults include alligators and humans. Musk turtles are not completely defenseless and release a vile smell to scare away their predators. They also have strong jaws that they use to bite. Loggerhead musk turtles are not said to be high maintenance pets. They are small in size and do not require large tanks. A 30-gallon tank is usually good enough for an average loggerhead. One thing though, is that they do require high oxygen levels as they stay mostly in water. They are messy eaters, so you need to make sure you have a high-quality filtration system in place. They only need fed 2 to 3 times a week, but hatchlings should be given food on a daily basis. They can be fed aquatic insects, earthworms, fish, and snails as well. These are not considered an endangered species. However, human residencies and habitat destruction are a big threat to their population. Along with that, pollution threatens their food availability as most of the insects and mollusks fall prey to it. These make great pets for most turtle lovers and don’t take up too much space. So, over to you. What do you think? Will you get one? Do you already have one? Let me know in the comments below!